The use of the AP Labs is governed by two policy statements; York University’s Computing Policies and the eServices Office Policies (see below). As a user of these facilities, it is your responsibility to know and to abide by these policies. The AP Labs computing facility policies are noted below. Some of the eServices policies may be altered or amended to accommodate special events as approved by eServices staff. Failure to comply with these policies may result in the temporary or permanent loss of your FAS Account (i.e. AP Labs, computing commons, libraries, etc.). Computers are available on first come, first served basis – no reserving. No workstation ‘locking’. General Information LA&PS Faculty members wishing to make a lab reservation should submit their request(s) to their local Booking Agent (Departmental Administrator or their official designate). All reservation requests must be submitted by the Booking agent, using the On-Line Scheduler. If you are not part of the LA&PS Community, please continue to use the on-line booking form at this time. Some of the information required before submitting a request is; Booking Title, Course Name, Code and Section, Required Software, Dates and Times. Reservation placement is made by The eServices Office and is based on effective use of lab resources and software availability. eServices reserves the right to relocate bookings to alternate labs in order to accommodate booking conflicts or emergency maintenance operations (alternative lab with proper technical and software requirements). Requests are confirmed on a first come, first serve basis within the following time-frame. 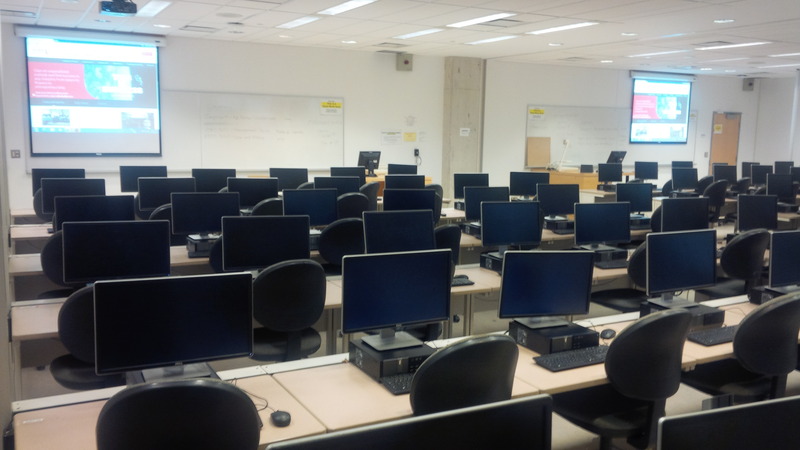 Reservations are typically made for classes/tutorials that meet weekly, or for ‘ad hoc’ reservations for activities such as software demonstrations, tutorials and computer based tests/exams. A ‘presenter’ (i.e. faculty, TA, staff) must be present in the lab during your scheduled time. If no instructor is present 15 minutes after the scheduled start time, your reservation is cancelled and the lab becomes available to other users on a walk-in basis. Reservation requests can be submitted after any sign-off date, but accommodation is more likely if the request(s) are submitted within the noted time-frame. All reservation should be submitted at least five (5) working days before the day of use. Scheduling Conflicts In the event of a scheduling conflict, The eServices Office will attempt to resolve the conflict by locating alternative campus locations or by negotiating a resolution with the affected parties. In the event of a conflict at the lab door just prior to the class/event, the posted reservation takes priority. Please contact The eServices office immediately (DB 2120 or 416-736-5622) to resolve the conflict. The lab software that is required for a course or an event should be recorded in the Booking Reservation request. Software changes in the labs will be considered when they are received at least two (2) months prior to the beginning of any semester and are dependent on titles, versions and licensing. If the requested software is not currently available in the labs, eServices will work with UIT to arrange to have the software installed. UIT provide software support for the LA&PS Labs and installation timing is dependent on their availability. The lab hardware is composed of the lab workstations, the podium PC & Audio/Video equipment and the touch screen controller. The hardware should not be unplugged or physically altered in any way. Hardware and software may break down in spite of our best efforts to maintain the labs. Promptly report all problems to The eServices Office by phone or e-mail (esohelp@yorku.ca). B&W and colour printing is available from all of the lab workstations. Instructions for printing are posted by the printer (just outside DB 2003). Print jobs are paid for by logging into the printer (using the printer control panel) with your PPY credential (the same credential used to log into the workstation). You must have a balance on your YorkU Card. Single sided and duplex printing is available: B&W @ $0.10 per printed side and colour @ $025 per printed side (8.5”x11”). The lab hardware is secured by static steel aircraft cables and by an active fibre optic alarm system. Any attempted theft of hardware will trigger an alarm at York central security desk. If you have an issue with your personal security, you can, visit the eServices Office (DB 2120), call York’s Security (416-650-8000). For emergencies call 911, then York’s Security at 416-736-5333 (or extension 33333). 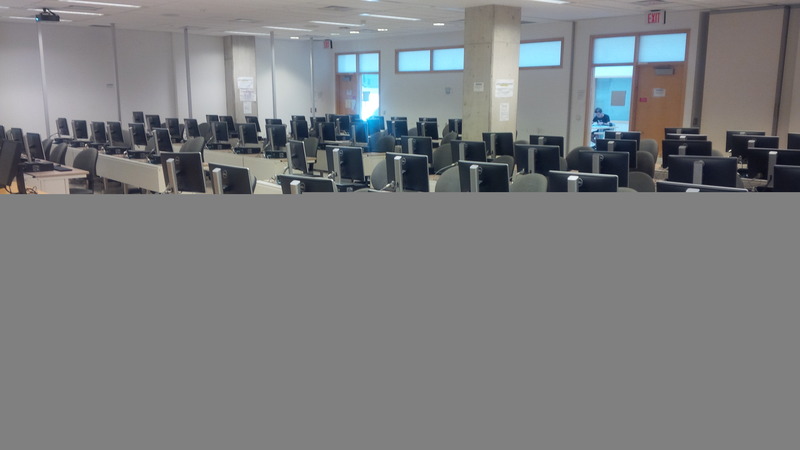 If you require assistance in the labs, please visit DB 2120, call 416-736-5622 or send an e-mail to esohelp@yorku.ca . The Lab Coordinator, a Lab Monitor (Work Study student) or other technical staff may be able to assist. If you have lost anything in the labs and it was turned in, visit DB 2120 and ask for help with the Labs Lost and Found. If you find something left behind by another user, please take it to DB 2120 to be added to the lost and found. Key Contacts / Booking Agents LA&PS community members should contact their departmental Administrative Assistant to submit reservation requests on their behalf. If your department is not listed below, you can contact the eServices office (ext. 55266) directly for more information. Contact the Administrative Assistant for the departments listed: ADMS, COMN, CMCT, DEMS, DVST, ECON, Equity, FACC, GEOG, HIST, HRM, HUMA, ITEC, MLC, PHIL, POLS, PPAS, SOSC, SOWK, WRIT. This document is a reference guide for the use of the LAPS On-line Resource Scheduler. The Admin link allows a selected number of people to view bookings, with additional access to request AP Lab bookings. The Public link allows people to only view calendar entries. There are a number of ways to navigate through the booking system process. This document provides a guide to one of the possible ways to navigate through this process. You may find a different ways to use the scheduler as you become more comfortable with its functioning. Follow the Admin link to the scheduler and login with your Passport York credentials. Click on the DATE FIELD at the top center of the window. Browse to the date of your booking request and click GO TO. View the availability of the labs in the Area you selected (capacity is noted beside the lab room number). To select a time-slot, under the room number of a specific lab (Please see NOTE 1 regarding lab selection), click on start time of you booking and drag to the end time. If more than one lab is requested, drag the mouse across into the adjacent room number. The “Add Entry” form will appear, prompting for booking details. Double check the Start Date and Times for accuracy. Leave the REPEAT TYPE, AREA and ROOMS, as is. Select the Type of booking from the drop down menu. Select Tentative or Confirmed (Please see NOTE 2 for explanation). Enter your home Faculty and Department. Enter the Course Code, Course Name, Software Required, Audio Video needs, and any Additional Information (all fields only if applicable). The green check marks, or red Xs are the bottom of the window indicate if there are any booking conflicts (left) or policy conflicts (right). If there are booking conflicts, they can be viewed by clicking on the red X. Your booking will now be reflected in the scheduler (as either confirmed or tentative). All bookings are PENDING until such a time they are confirmed by eServices. Follow steps 1 - 9 from above, selecting the first day of your repeating booking. Select the Repeat Type and enter the additional information (if applicable). Click in the Repeat End Date field and select the last date of your repeating booking. Continue with steps 11 – 18 above. 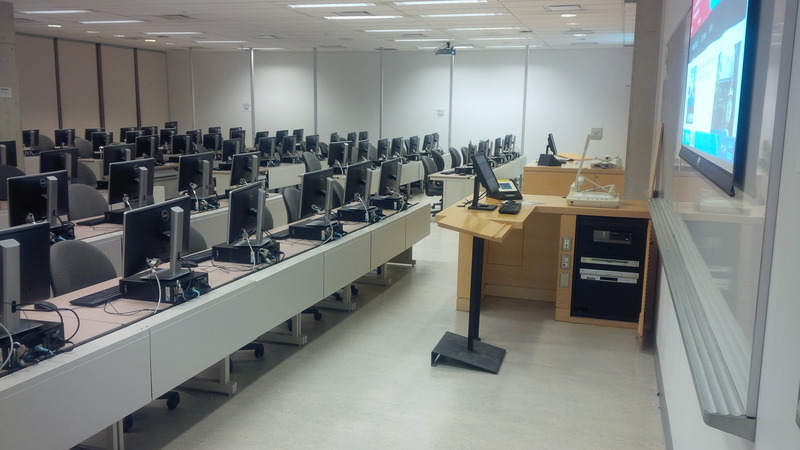 NOTE 1 In order to provide the most efficient use of lab space there is a specific order in which to book lab space. Please see the table below. There are two systems you will normally use; the AV controller (the small LCD touch-screen on the podium) and the PC. Here are steps to follow to use the systems. 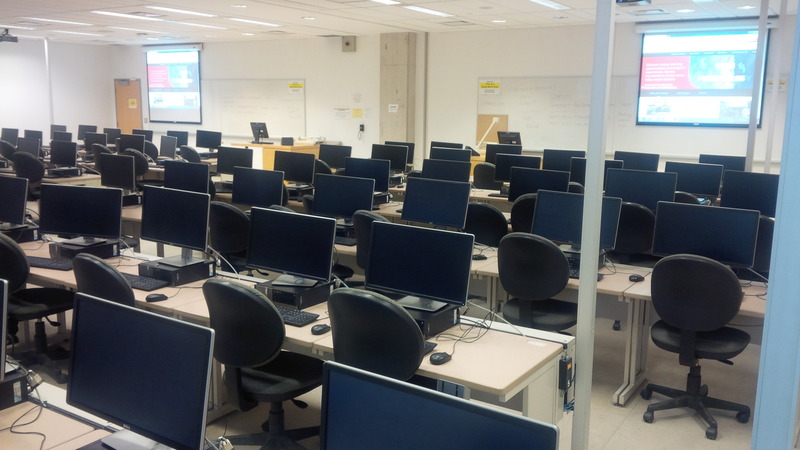 I recommend visiting the lab(s) prior to your first class to test the configuration you wish to use. If you would like assistance, please make a request by sending an e-mail to esohelp@yorku.ca . turn on the PC by pressing the large button on the PC. General rule: press the media device your want to project, then the "Projector" button. (when the screen reads "Please Wait", do not press any buttons). You may have to press two projector buttons, depending on the lab configuration. These short steps are very important for security reasons. on the right side of the AV controller, press QUIT , then YES. this will finish the shutdown procedure for the AV equipment. Instructors are encouraged to bring course material on a USB Memory Stick, CD-RW, DVD=RW or floppy disk. If a student is giving a presentation, the instructor can allow the student to use the podium PC. Files can be accessed from media brought to the lab or from the students network home directory. The podium PC hard drives are protected. Any changes made to the hard drive will be removed when the PC is shut down. Jobs can be sent to print to lab printers (a York copy-card is required and the normal cost will be applied.